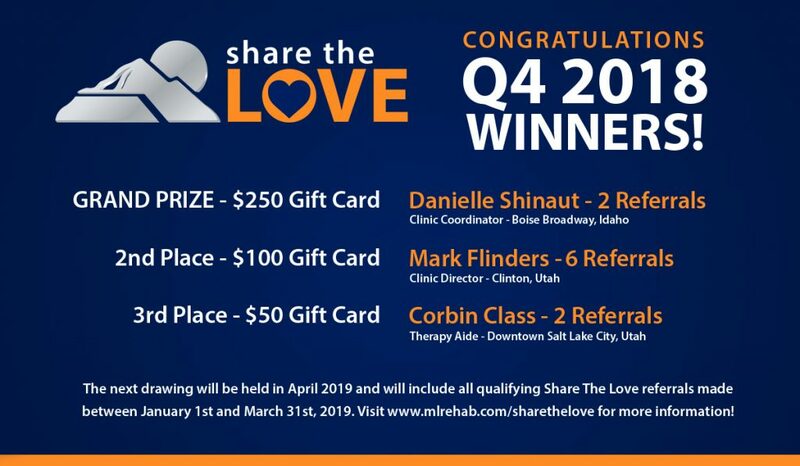 Q4 2018 Share The Love Winners! It’s time again to announce the winners in our quarterly Share The Love Drawing! Congratulations to Danielle Shinaut, Mark Flinders, and Corbin Class, who each won an Amazon gift card by referring their friends or family members to Mountain Land! Our next drawing will be in early April and will include all qualifying referrals sent in between January 1st and March 31st. Be sure to make your referrals count by entering them on our website at www.mlrehab.com/sharethelove.